Did you know that Sunset Park is the humble host to an art gallery? I mean a real, high-ceilinged, shows lots of pieces art gallery. The Tabla Rasa Gallery is located at 224 48th Street (between 2nd and 3rd Avenues), and it's affiliated with SPArC, or the Sunset Park Arts Community. Not a long walk, no matter what part of SP you call home. Starting on May 22nd and running through June 26th, the exhibition "Bridge as Icon" will be the focus at Table Rasa. There is an extensive list of artists contributing to this show. The website has the full list. Here's my favorite thing about the gallery (well, other than that they display darn good art): it's free and open to the public. No cost, and no invites needed. That means that nerdy, out-of-touch, don't get special notices and invitations to artsy stuff people like me can just stop in! Oh yeah. The gallery is open Thursday through Sunday from noon to 5 PM. The phone number is 718-833-9100. And according to the website there might be a special summer schedule. Does anyone want to check it out one of these Thursdays? 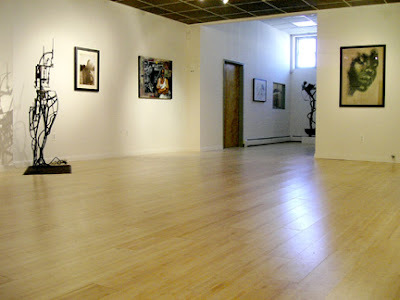 Check out the Tabla Rasa website for a look at the gallery and what they've shown in the past. The photo above is taken from the website, as is all the information herein.